Fire Police have always been zealous about how they look in public, none the more so wearing the distinctive helmet, unmistakeably associating them as members of the Fire Service. Today's safe and comfortable helmets contrast sharply with those of yesteryear ... in the beginning few Auckland Fire Police members had protective head gear of any kind! Fire Police, like fire-fighters of the era, first wore the uncomfortable and cumbersome brass helmet. There were tales of men packing the inside with soft cloth to protect their heads from the rivets, stiff leather liners and harsh metal edges. The helmets were "showy" but took a lot of polishing to keep them glinting in the sun. Officers wore silver-plated helmets, other ranks retained the brass. Not all Fire Police were lucky enough to have them issued. 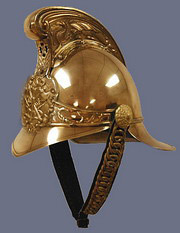 Black Cromwell helmets, named after their British makers, were gradually introduced, replacing the brass, and issued to all members of the Auckland Fire Police. The Cromwells had the distinctive letters "FP" painted on the front in white lettering. Reflectorised bands were introduced - white for Officers, red for Constables - together with diamonds along the side denoting rank, 3 for the Captain, 2 for Deputy Captain and 1 for Lieutenants. Auckland Fire Police were issued black polycarbonate helmets soon after they were issued to fire-fighters. Their distinctive American style suited the Fire Service's increasing adoption of US uniform and equipment (bunker coats, high pressure pumps, Snorkel aerial appliances). The letters "FP" were replaced with the words "Fire Police" beneath the Fire Service logo, red and blue markings were introduced, but the diamond rank markings were retained - later officers had their rank, in words, included across the front of the helmet. 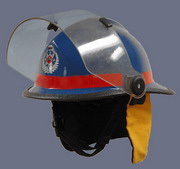 Locally-made helmets were issued by the Fire Service, coloured yellow for fire-fighters, blue for Fire Police, complete with the new Fire Service badge, surmounted by the crown. Visors and neck-flaps were provided in1986. Fire Police bands/rank markings were changed to yellow and helmets were later personalised with members' names showing along each side (discontinued in the early 2000s). Rank markings are being changed in 2007: the yellow band signifying Constable becomes red (to bring it into line with fire-fighters' markings on their yellow helmets) while the yellow band is retained for Officers. The Pacific Helmet was retained at the changeover to Operational Support. The words FIRE POLICE on the front were removed, leaving a single plain red band equating Firefighter rank on yellow helmets. Similarly, other ranks in Operational Support will mirror NZFS standard markings. A different helmet, a light-weight general-purpose model, is prescribed for Operational Support personnel but in Auckland it was decided to make the change to the new style as each Pacific Helmet becomes unserviceable. Between 1977 and 1981 the National Fire Police Association suggested that all Fire Police should be issued with construction-style helmets, supported by some Fire Service HQ Executives. Auckland Fire Police vigorously opposed this, saying Chieftain helmets gave superior protection particularly during salvage work. The Unit withdrew its membership from the National Association to show its displeasure. After long debate it was decided that fire helmets would remain: Auckland re-joined.